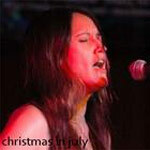 CD review: "Christmas in July"
This review first appeared in the December 7, 2006 issue of the North County Times. Encinitas' Julie Mack hasn't issued anything since her superb 2006 release, "Starlight Bungalow #37." This teaser from her upcoming spring release is not only her first holiday song (complete with sleigh bells), but offers the promise of something wonderful to look forward to in 2009. Mack's deep, rich voice remains a joy to hear, the song has a catchy melody, and the arrangement is a nice mix of SoCal surf and straight-up folk. It's a nontraditional (at least until those sleigh bells kick in on the outro) but very listenable addition to the holiday canon.